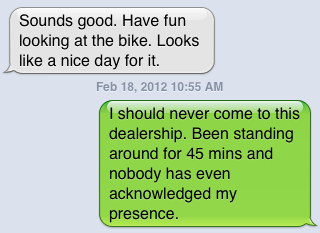 I have had a similar experience with a dealership here, oddly enough it sells triumps, ducati’s and suzukis. They will be standing around the desk doing nothing and they look at you as if you are sprouting a 3 head on your shoulders and don’t say a word of greeting. I get it that it may be the parts guy, but come on a little customer politeness goes a long way. They only have limited gear and very little women’s gear . There is almost a standoffishness and you get the feeling they are doing you a favor by helping you. Seriously I can’t believe the attitude. I almost want to say “Hey I am not doing you a favor by being here, I am keeping your business alive by wanting to purchase something from you.” I almost feel bad for going in there to look around. I just don’t get it. “hello” when you walk in goes a long way. Hmm. Maybe it is the Ducati part. 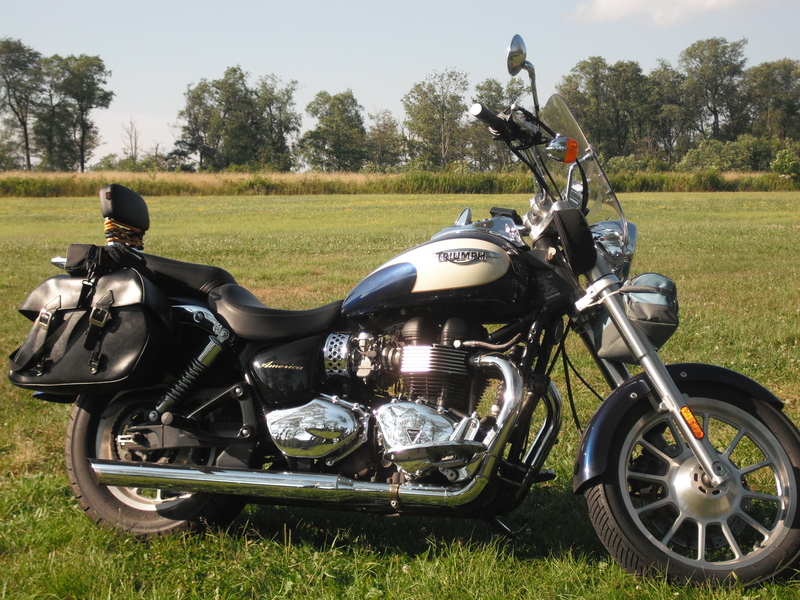 The central Indiana dealer has treated me the same way. I have rode in on a bike full riding gear. Walked in and the salesman who was talking to someone didn’t even acknowledge me with a nod. I drooled over a Hypermotard for about 20 minutes. A guy in the office looked at me though his window. Finally I walked over to see some of the used bikes, right passed the counter where 2 employees looked at me but said nothing. I looked a few more minutes. Went and drooled on the Hyper a few more minutes then rode away, happy that I had a Suzuki. The local Suzuki dealers are always happy to talk and help. Ryde4ever, I think you’re onto something with the Ducati angle. I visited another Ducati dealership in the Philly area last fall and had a similar experience, although that time I was just there to window shop and not buy so I didn’t think too much of it. But the salesman was pretty dismissive and clearly didn’t want to spend the time educating me as to their product.